Camfil Air Pollution Control (APC) announces an expanded fleet of mobile dust and fume collection systems that are available worldwide to provide training and education to customers. The trailer-mounted units are available on request and may be used for dust collection seminars or for more informal training on the basic principles of dust collector design, selection and operation. 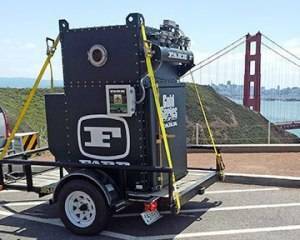 They are also being used to demonstrate the features of Farr Gold Series® dust collectors at professional meetings, trade shows and "Learn over Lunch" onsite customer events. Camfil APC now has more than 60 demonstration units traveling the world for programs conducted by the company and its network of representatives and distributors. Each unit is equipped with a high efficiency Farr "Gold Series®" dust collector. This collector is widely used for removal of fine dusts and fumes generated during dry processing applications and metalworking processes including welding, grinding, sanding, cutting, thermal spraying, metallizing and more.